Dream of Eurasia and Rolle of Japan | Think the Unthinkable Future. I’m now waiting for my NH flight to this time’s final destination “TOKYO/HANEDA” in the Gimpo Int’l Airport/Seoul. From 17 to 18 April, I was invited to the Eurasia Business Forum in Almaty, where I delivered a speech in a session called “Future of Energy”. To be honest, I hardly imagined Kazakhstan has developed and continues to develop in spite of the on-going financial crisis since 2007. Furthermore, I’m very impressed and astonished to hear that the participants spontaneously praised for the Japanese style of economic development. Japan is apparently regarded as nation of success there. During the forum, it was quite remarkable for me that the Kazakh delegates often expressed their caution to be de facto controlled by the Russian. In the context of the current tough negotiation regarding the Eurasian Custom Union, for example, many participants of the Kazakh authorities referred to the importance to maintain their own national interest, even though Russia plus Belarus keep trying to let their rules be applied to other parties. In addition to that, the Kazakh generally don’t hesitate to mention they resemble the Japanese. Even the chairperson of the forum introduced me as a key note speaker by saying he believed at a glance I were Kazakh. What a splendid expression of amity it was! You can read the script of my speech below, which I checked and slightly corrected after the session. This was the very debut for me to act as one of global opinion leader in Eurasian scenes. Next month, I’ll take part in the St. Petersburg Economic Forum, while I’ll be invited as a panelist for the session on open data and its role in the current world. The second stage of my life finally began and is accelerating. Can you catch me, while I’m galloping through the world?? “Think the Unthinkable between the West and East. It is a great honor for me to be invited as a keynote speaker to this forum. This is the very first time for me to visit Kazakhstan, even though I served as Japanese career diplomat for 12 years. At that time, I was once posted in the Bureau for European and Oceanian Affairs in the Ministry of Foreign Affairs and mainly took care of diplomatic relationship between west European countries and Japan. Next door to my division, there was a tiny unit for the NIS countries, where my Russian speaking colleagues were in charge of Kazakhstan. That was in about 1999. To be honest, there was no Japanese diplomat who could correctly anticipate brilliant development of NIS or CIS economies afterwards. Taking this opportunity, I must confess to you, ladies and gentlemen, I never thought of such an economic success of these countries including Kazakhstan. In this regard, I’d like to show great respect to all my friends in Kazakhstan for their efforts beyond description they made after the declaration of independence. Today, the global community is facing a variety of common issues. Because there are so many issues to be tackled, we can’t grasp what they really are. A Japanese proverb says, “When you look at a single wood, you never recognize the forest as a whole.” So, I’d like to recommend you, ladies and gentlemen, to see the things from the opposite side. We should start with the “forest”, and then finally reach each wood. What’s the origin of all these global issues? You might have several different answers, but I’d like to point out the most decisive one: The abnormality of solar activity. Normally, the sun changes its activity every 11 years cyclically. However, it is observed by astronomers that this cycle can’t be found in its current activity. In addition to that, the Japanese solar physics satellite called “HINODE” discovered the sun’s magnetic field had flipped. “The bursts would have wreaked havoc on the Earth’s magnetic field, matching the severity of the 1859 Carrington event, the largest solar magnetic storm ever reported on the planet. That blast knocked out the telegraph system across the United States, according to University of California, Berkeley research physicist Janet Luhmann. “Had it hit Earth, it probably would have been like the big one in 1859, but the effect today, with our modern technologies, would have been tremendous,” Luhmann said in a statement. A 2013 study estimated that a solar storm like the Carrington Event could take a $2.6 trillion bite out of the current global economy. Massive bursts of solar wind and magnetic fields, shot into space on July 23, 2012, would have been aimed directly at Earth if they had happened nine days earlier, Luhmann said”. End of the quotation. Ladies and gentlemen, this is the reality we are now facing together. You can’t divide the sun among countries. The sun is sun. Everybody on the earth has been and will be affected by this dramatic irregularity of the solar activity. Scientists already suspect this simple but decisive fact influences magnetic fields of the earth and its climate. But the problem is they haven’t found out yet how such a mechanism works between the sun and earth. Based on this scientific ambiguity, there are still some scientists who never recognize the close relationship between the solar activity and climate change. At this stage, I must say, “Seeing is believing”, ladies and gentlemen. In the last couple of years, we suffered from heavy snowfalls in Washington D. C., London and Tokyo. In Tokyo, my hometown, for example, we had heavy snowfalls and –storm even two times in the last February. This kind of phenomena was really unprecedented in the Japanese history. In short, the climate has been steadily changing. We must prepare for the global “cooling” in the conventional centers of western civilization, while other regions around the north pole like Russia and Canada obviously face the global “warming”. This is the second fact I’d like to underline here, ladies and gentlemen. And that causes then irregularity of global health especially in the northern hemisphere. It’s already proven scientifically that human immune strength is weakened to 60%, when atmospheric temperature goes down 1 °C lower than before. When that is the case, everybody slows down his daily activities, which off course leads to stagnation and deflation of economy. As a matter of fact, western economies except for Japan, which is now trying to undertake the “ABENOMICS”, begin to tackle irreversible deflation. Although the FRB and ECB has stuck to their QEs to stimulate the economy, the timing is coming when they admit they fail. This new financial and economic reality is gradually causing massive capital flight to new safe havens, where we can still dream of further inflation just for a while. Now, you may wonder what to do. In principle, you can’t avoid this process as long as you live on the earth. Only thing we can do is just to adapt ourselves to this dramatic change of all our surroundings. To survive this unprecedented hardship, the global community gradually becomes aware of two things, which will be more and more important in the course of time. They are “renunciation of war” and “innovation”. In the conventional capitalism including ultramodern one called “financial capitalism”, we can’t help repeating warfare cyclically to keep the inflationary economy. In the inflationary economy, everybody puts emphasis on becoming “rich” and tries hard to make his own business bigger. That inevitably leads to bubbles and their collapse. To adjust differences between supplies and demands, global leadership has always made use of warfare to raise the latter. After the wars, the economy has been successfully adjusted at the cost of the massive war dead. That’s the hidden truth in the modern and contemporary world history. But the rule has been just changed. In the era of global and total deflation, we don’t need bubbles and their collapse any more. Instead, we urgently need a set of brandnew rules for living and cooperating together peacefully. From now, the spirit of symbiosis beyond nationality, ethnicity and differences of opinion is needed. In this context, your turn is coming, ladies and gentlemen. Why? Eurasia is pierced by the Silk Road. History shows clearly the traffic between the west and east on the Silk Road was maintained peacefully in the Middle Ages. Cultures of every nations in the region of the Road must have inherited this tradition. 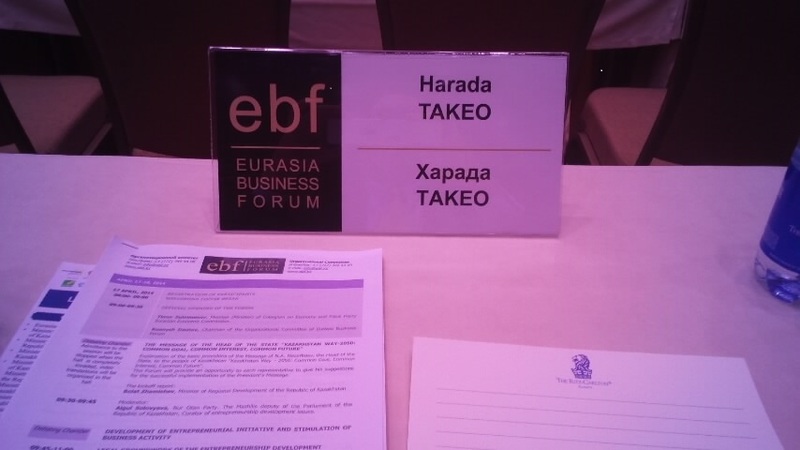 And based on this tradition, the Eurasia Business Forum is organized and held, as far as I understand. Regarding the urgent call for innovation, I must shortly explain why we still need innovation. Innovation is always needed. That’s true. However, by saying this word, I actually mean production of “genuine” added values. Except for that, every so-called “innovation” is simply absorbed in commoditization, which is sharply accelerated in the current total deflation. In this regard, I’d like to touch upon what this kind of real innovation can be. My answer is “transmutation” and “cold fusion”. Both of them have been denied, rejected and disregarded by leading scientists especially in the western countries for many years. Although obvious phenomena thanks to these high technologies are frequently discovered in laboratories, they loaf on recognizing them. They prefer simply keeping their conventional scientific theories to going beyond them. This tyranny of leading scientists should be just wiped out for the sake of real innovation. Taking the example of “transmutation”, I’ve been personally following and assisting dramatic development of related technologies owned by a venture company in Kanagawa, Japan. The researchers of this venture have struggled to get official and scientific recognition of their innovation for more than 10 years, even though almost nobody showed interest. But the time has changed since 2011. Ladies and gentlemen, as you must know, the Fukushima Dai-ichi nuclear plant has spread various, extremely dangerous radioactive substances after the Great East Japan Earthquake on March 11 in that year. Among severe tasks the Government of Japan and her society have been tackling, you can find on-going discharge of tritiated water from the nuclear plant. In the last March, the researchers succeeded to undertake an experiment of verification of their transmutation technology. It is scientifically proven that this technology can be basically applied for detoxifying of tritiated water. This must be glad tidings not only for Japan but also for all other countries, which also have suffered from similar and severe nuclear issues. I hope you now understand the whole “forest”, in which we’re living, instead of sticking to single “wood”. Every time the human kind faced difficulties, which once seemed not to be overcome, it always managed to reach final solutions together to move forward. That’s the essentials of the world history. Within five years from now, everything will be changed on the globe. Conventional frameworks in both of our brains and international community will be replaced by new ones. It’s true to keep thinking and continue to something innovative is very hard for all of us, on the one hand. But on the other hand, the period ahead of us now is so exciting that we shouldn’t miss every simple opportunities. For this purpose, we come together here in Almaty, I firmly believe. Last but not least, I’d like to express my warmest thanks to the secretariat of this forum again and wish all of you, ladies and gentlemen, successful encounter and collaboration during the events. Thank you for your kind attention.